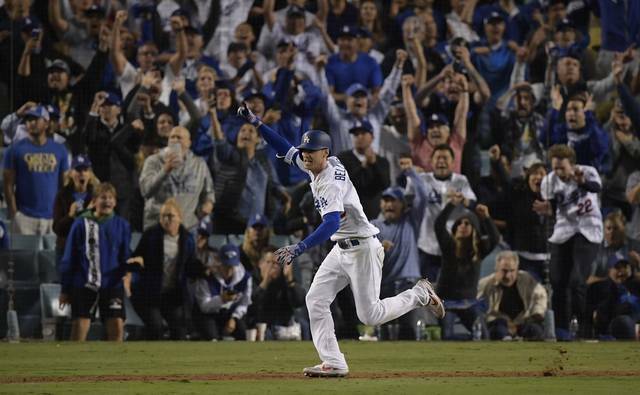 LOS ANGELES (AP) — By the time Manny Machado rounded third base, the Los Angeles Dodgers had already started streaming out of the dugout. Bellinger laced a full-count pitch from Junior Guerra into right field to score Machado, who was nearly picked off second base moments earlier. Instead, he slid home and touched the plate with his left hand to beat Christian Yelich’s throw and finally end an October nail-biter that took 5 hours, 15 minutes. It was the fourth extra-inning postseason game in Dodger Stadium history, and the home team’s first such win since beating Philadelphia in Game 4 of the 1978 NLCS. After a quick turnaround, Game 5 in the best-of-seven series is Wednesday afternoon, with Wade Miley pitching for the Brewers on three days’ rest against fellow lefty Clayton Kershaw. “We lock it in, win one tomorrow, and we feel a lot better heading home,” Yelich said. With one out in the 13th, Machado hit a broken-bat single to left field and went to second on Guerra’s wild pitch. With first base open and a struggling Yasmani Grandal on deck followed by the pitcher’s spot, the Brewers chose to pitch to Bellinger — and it cost them. Dodgers starter Rich Hill allowed one run and three hits in five innings. The Brewers tied it 1-all in the fifth on pinch-hitter Domingo Santana’s RBI double that took one hop against the right-field wall with Yasiel Puig scrambling in pursuit. The Dodgers led 1-0 on Brian Dozier’s RBI single in the first off Gio Gonzalez, who left after twisting his ankle while trying to field an infield single by Puig in the second. Gonzalez has a high ankle sprain and will probably need to be replaced on the roster, Counsell said. The sellout crowd of 53,764 was considerably noisier than on Monday, when Enrique Hernandez criticized Dodgers fans for being too quiet. Joc Pederson and Bellinger waved blue rally towels in the dugout. But the Dodgers again struggled at the plate after going 0 for 10 with runners in scoring position during a 4-0 loss in Game 3. Milwaukee put the potential go-ahead run on third in the seventh before Cain grounded out against Dylan Floro. The Dodgers had runners at the corners in the eighth against hard-throwing Josh Hader, who pitched for the second consecutive day. Pinch-hitter Matt Kemp struck out to end the threat. 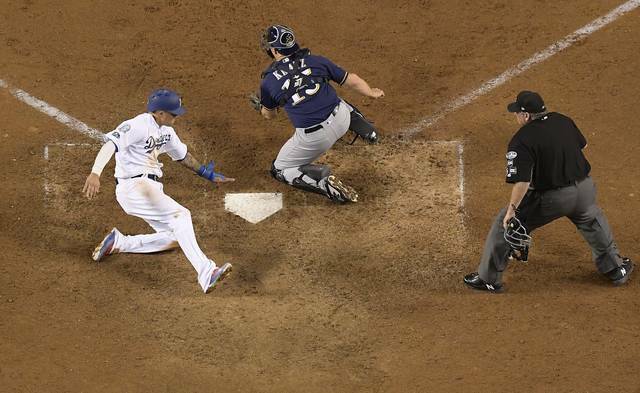 The Brewers had another chance in the ninth against closer Kenley Jansen. With fans on their feet, pinch-hitter Travis Shaw struck out with a runner on third to end the inning. In the 10th, Ryan Braun singled with two outs and stole second against Jansen, who struck out Jesus Aguilar. 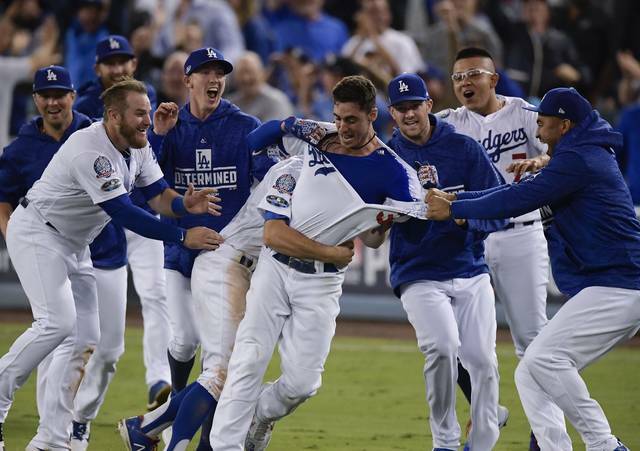 And when Bellinger finally ended it, the only NLCS game that had lasted longer was the New York Mets’ 15-inning victory over Atlanta in Game 5 in 1999, which took 5 hours, 46 minutes. “It’s a dirty play by a dirty player,” Yelich said. The Dodgers said tickets were still available for Game 5, which begins at 2:05 p.m. PDT. Brewers: Miley makes his third postseason start in Game 5 on Wednesday. He threw 74 pitches over 5 2/3 scoreless innings Saturday in Game 2 of the NLCS, allowing two hits while striking out three and walking none. His other start came in Game 3 of the NLDS at Colorado. He didn’t factor in the decision either time. Dodgers: Kershaw took the loss in Game 1 against the Brewers. Kershaw had the best postseason outing of his career in Game 2 of the NLDS against the Braves, allowing two hits over eight shutout innings.